A total of 144 units were sold and have been shipped today (Tuesday 22 Feb). On Sunday at 22:00:00 I updated the inventory to 130 and Paypal had oversold to a total of 136 by 22:01:22. I placed another seven units on a minute or so later and Paypal oversold to eight, making a total of 144. 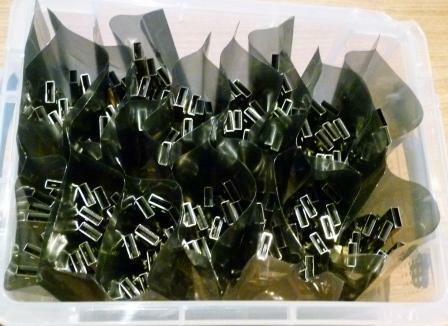 151 FUNcube Dongles after HPF Rework, ready for placing in enclosures. Firmware programming and system test. I received 151 units on lunchtime on Friday. By Saturday lunchtime all 151 had been tested and 16 units with faults had been fixed. The HPF rework and retest. I discovered that the LNA performance degradation and 1nF capacitor cracks are definitely caused by temperature fatigue. After the first ten units (four LNAs failed or degraded! ), I dropped the tweezer temperature to 305 deg C (was 350 deg C) and the iron temp to 260 deg C (was 320 deg C) led to only one LNA replacement and no cap failures, previously I’d have had to change dozens of LNAs after rework. Only two units required other HPF fixes due to iron operator error. Populating enclosures and retest. 100% success and no rework required! Concurrenly, printing postage labels and packing slips. Pretty much from Friday lunchtime to Tuesday lunchtime it has been full-on 16 hour days, I am ready for a day off – and as it happens I am under strict orders to go away this weekend, and I don’t think I’ll be allowed to pack any dongle related stuff. Awesome work Howard. Not only the design and implementation, but the documentation at every step of the way. I’m looking forward to mine arriving. There is an SMA attached to an antenna already! Well, go get a breath of fresh air. It makes wonders after so much hard work! Hello. It’s a pitty. I was late !. I’m eager for next sale. (I hope to be sucessfully). Hi Howard, FCD arrived at 0805 this morning 28th February. Great postal service. That is excellent! Postal services do seem to be extreme though, you seem to be at the lucky end of the scale. Good luck and I hope to pop over to see you over there again soon, although my business travelling days have almost completely dried up these days I’m afraid, so almost no frequent flyer mileage flights or “side trips” for me. FCD serial 0590 arrived Saturday. For the first tests I used Windows XP in a VMWare machine on an Ubuntu host. The sensitivity of the device is amazing for a wideband receiver. When I switched the device into boot mode in order to update the firmware, my computer completely crashed. I triede it a second time with the same result. The Linux USB drives do not seem to like the FCD in boot mode. Finally I booted my computer to native Windows and made the firmware update without furthor problems. If you had an idea of the cause of my crashes, you could have a look at it, but it has a low priority. It is acceptable for me to boot to Windows from time to time to do the update. This is more an information for you and others who may experience the same problems. The Linux/Mac software I wrote will not be as bulletproof as the Windows stuff because (a) I am a novice Linux/Mac programmer and (b) I found that writing cross platform code adds a whole extra dimension particularly at a system level. I am aware that the cross platform QT code has already been taken up as a GNU project so you will undoubtedly find some updates very soon. Nr. 554 is up and running! One FCD ok in Romania. Great stuff! Another new country for us, when will I make FCD DXCC? One FCD in Portugal. Tanks. Now i´m go to test it. Thank you for giving me another FCD DXCC entity! The first FCD in TURKEY (Item#0001 and S/N:454) arrived today in ANKARA, ..
I’ll be busy to test it for a couple of days. Congratulations! 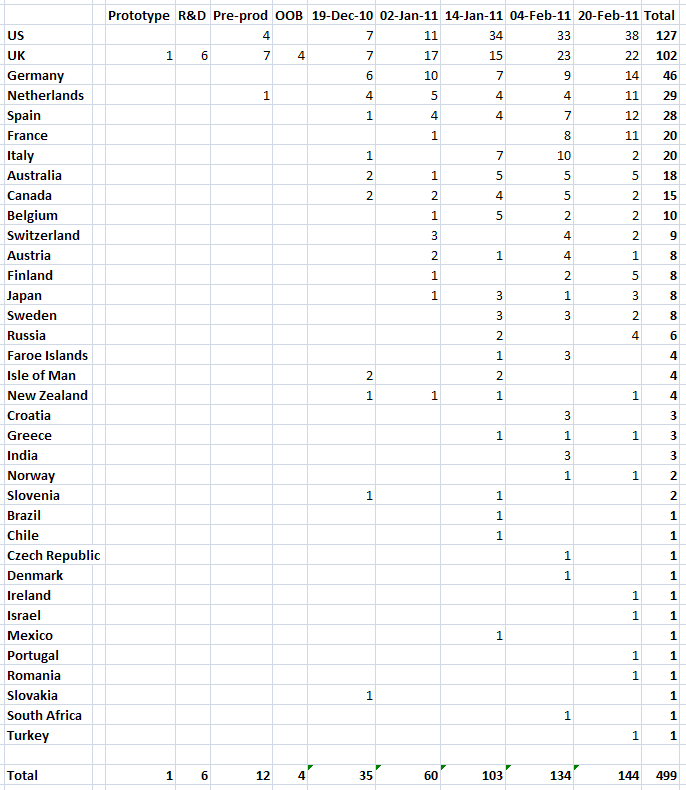 We always look at the list after each sale for new countries, and we certainly saw yours. My 16 year old nephew, who helps with the packaging, has learnt more about geography in the past two months than 12 years of schooling! Certainly I can mail you a replacement case. Is there any indication of how it broke – was it during transit? Regarding screening, you will see that the bottom of the PCB is almost entirely a ground plane – that was by design of course. You’re right about the bandwidth not being quite enough for crisp wideband FM reception. I can look into adding frequency stepping into the FCHid program. Originally the FCD wasn’t really designed for scanning functionality, but I can see why some people might want to use it in that way. In fact, I did put step functionality into the QT version of the program. but it might be a transportation broke …. I airmailed you a replacement case this morning, no charge. Please consider using WRPlus with the FCD application that will allow you to change frequency by mouse clicks. It works well! See the Yahoo group for instructions and software to download. Do you know how can I adjust the DC ofset in this program ? Have barely budged from the computer for 1 1/2 hours.